Imagine an organization that brings out the best in people and removes the undesired weight of constant decision-making from those in charge. An organization driven and aligned by purpose, supported by a structure that distributes the power to the project teams that know best, ideally resulting in a massive reduction of stress for everybody. Is such a thing possible? What happens if we start asking entirely different questions about the organization? If we shift from “how much” to questions such as: “what for”, “why” and “how”? 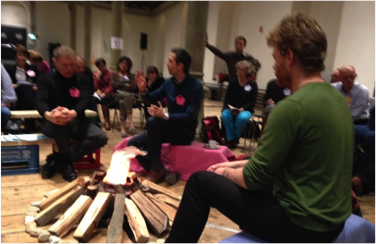 We wanted to explore just that, so Christiane Seuhs-Schoeller and the LiFT team invited Frederic Laloux (“Reinventing Organizations”, Belgium), Christian Felber (“Economy for the Common Good”, Austria) and Tom Thomison (“Holacracy”, US) to Vienna last week.